It is the month of winds; the month that begins with a roar. The air keens with a single, high-pitched note. I don’t know what it is, except that it is a note borne of the wind’s passage through structures of glass and steel. A road sign rattles on its pole. Streetlights wobble and chink. One of last year’s leaves crackles across the path. Hawthorn twigs hiss and trees creak. The bass note is the boom and roar of the gale. I am a child of the March winds, blown into the world with the rush of wind in my ears. Perhaps this is why the wind-song comforts and exhilarates me. Perhaps this is why the rush of the March winds feel like being born once more. Wind is perhaps the most mysterious of weather. It has no substance, yet it can raze towns and sculpt the hardest of landscapes. It has the power to be a balm on a hot day and a misery on a cold one. It appears from nowhere and drops just as quickly. Some say that it is possible to capture the wind in a knot of yarn, or to conjure it with a whistle. But such tricks require magical skills, because wind isn’t a thing that an ordinary person can hold. I see the wind only by its actions and by what it gathers up. Tall birches that jerk and sway. Scots pine gently undulating. A service tree waggles slender fingers tipped with grey-green buds. Red-leaved shrubs move like a whip of flame. Daffodils bob crazily and grass becomes flickering ripples of silver. Catkins slant as one, like tiny wind socks. Great hunks of clouds are moving. A dozen wood pigeons sway in the highest branches of a sycamore. How can the movement of air be so powerful? When it is behind me, it urges me forwards. Before me and I must fight to move. It roars past my years and whips my hair. But when I stand in the wind, when I let myself be still, the air gentles. I see it still whipping up the trees. I can hear its boom. But if I offer no resistance, it befriends me. I feel it like the breath of the earth, urging me on, blowing me out of my winter torpor towards the light of life and spring. 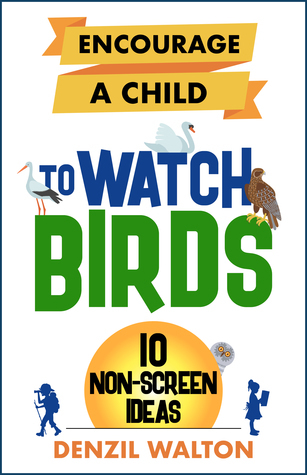 This little gem of a book is designed to help adults encourage children to get away from their computer screens and outside to watch birds. The book gives some good, basic facts about the birds you and your child might see and provides questions you can ask to encourage the child to watch the birds and talk about what they’ve seen. I know a bit about birds and still learned new facts, but this book makes it easy to start even if you know nothing at all about birds. The activities and discussion points are open enough that they’re suitable to use with a child of any age and you don’t need to live in the countryside to use this book – it focuses on parks and gardens, even apartment buildings. It begins with the easiest of activities – watching ducks on a pond – and progresses to things like how to use binoculars and dissecting owl pellets! The book is well-written, easy to understand and there is a sense of great enthusiasm for the subject throughout the pages. Thoroughly recommended to share with a child. You can find Denzil here and his book is available on Amazon. Love your photos, and your words on the wind. I would add: the song of cords against metal masts down at the marina, and the scrap and slurp of a wind-tossed yob-thrown Special Brew can. Beautiful post. March does have that exhilarating energy of rebirth. I especially love the third photo with the purple and blue of the sky behind the trees. I hope your day of celebrating being a child of the March winds was a most happy one! I’m just about to go mushrooming! I never cease to marvel at the wobble of the earth! It was thank you Bruce, I hope your mushrooming was fruitful! Enough for a couple of omelets! Happy birthday Andrea. Your poetic essay almost makes me like wind. Certainly the sounds are hypnotic but I find wind powerfully unsettling. Thanks Susanne, I can understand why, my partner hates it. Thank you so much for the wonderfully crafted review Andrea; much appreciated. You’re very welcome Denzil, it’s an appropriate time to start using it. Love your creative descriptions of the wind. I swear I felt the breeze on my cheeks as I read your post. Beautiful meditation on wind. Happy birthday, too. I am going to differ with you on this subject. While I would not want it to be too still and like a very soft breeze, I hate actual wind. I find it to be way too aggressive for me. Wonderful post and pictures. Your book review of Denzil’s new bird book is very nicely done. I always look forward to your posts. This was a favourite little gem as a child. Your post has brought back some fond memories. Thank you. I am a child of the wind, also born on the first full day of Spring. I will be celebrating this week. I consider this post a harbinger of good things to come for me and you all children of the wind this year. Gale force winds generally freak me out. We’ve had our share this year, too. One gust tore a big ash down at the edge of the yard, taking a maple with it. Ample firewood to be processed, free for the labor of cutting it. We have kindling to last a year! Thanks Eliza, yes it’s quite a good time to have a birthday 🙂 The damage the wind can do isn’t so positive, but winds are a fact of life here – though not as strong as in some parts of the world. I looove this! I always look forward to your lovely words and photos. Lovely post, Andrea. One thing I don’t like about the March wind is it blows the beautiful new blooms from the flowering trees…sigh. Gorgeous photos! It’s wonderful how you illustrate the virtues of March winds through your words. Personally, I feel depressed and even somewhat fearful when the winds show their force, sometimes leaving destruction along the way. I enjoyed reading a more promising perspective. Thanks Gail, they can be unsettling just because of the damage that they can do. March is often windy but this year the wind has been unrelenting – until this evening! I love your descriptions of the wind and its effects. Your photos are fantastic as ever; how did you manage to get those catkins to keep still! It has indeed. After some very heavy hail among yesterday’s winds, it’s finally calmed here. It was interesting to see the catkins all slanting in the same direction, but unfortunately I didn’t have my camera, so I cheated, these catkins are from a calmer day! lovely March on your blog! Oh, it was a windy weekend out on the soccer fields for us! Without the winds, the air temperature was actually quite bearable. Those Lion-esque winds though certainly have their say, don’t they! I can almost see the wind that blows the trees in your pictures, Andrea. Wonderful images in your words. This is brilliant writing, Andrea! Your ability to capture your surroundings in words is stunning. This is such an interesting post, Andrea. I tend to be intolerant of wind – an acupuncturist once told me that it makes people angry. But with your beautiful descriptions, I intend to be more embracing of this, as you so rightly point out, wonder. Thanks Francesca, I can understand why it could make people angry, it can be relentless! It certainly has been windy! Love your photos of the trees. Oh the wind! It is no stranger here on the point, let me assure you. And when it abates, there are few places I’d rather be. Your book recommendation: do you think it would suit an eleven year-old? I can imagine you get a fair bit of wind 🙂 I think you can use the book with all ages – it’s written from the point of view of the adult sharing with the child, asking them questions about what they see, etc. to help them observe and come to their own answers as well as giving information about the birds, so you whatever the age there can be an appropriate discussion and children of different ages will notice different things. It is an ode to the wind in prose leaving me with no options but to be mesmerised. Thanks Sandra. I love to hear the wind howling around the house, it’s a fabulously cosy feeling – ‘wuthering’, you know, I never thought to wonder before what wuthering meant! I’ll pay more attention to the wind today, Andrea, now that I’ve been prompted by your beautiful words. My favorite manifestation of wind is when I see gulls flapping their wings wildly, trying to fly forward but being pushed back by the wind. . . . Yes, I love to see those brave birds being buffeted all over by the wind, it must be hard work but I’m sure there’s a joy in it too! Also, lovely to see Denzil’s book featured here; a great review and hope it tempts even more us outside to appreciate the birdlife around us all.I found the book a great aid and inspiring to use. Thanks Annika, the wind has dropped here today so hopefully you’re getting some relief from it! I really enjoyed Denzil’s book and it was really interesting to read and see how it can be used to encourage young people to watch nature. Encouraging kids to observe nature and really appreciate it, and its effects on the soul is the perfect counterpoint to your blog that keeps us entranced in both the outdoors, the rhythms of the year, and of course your wonderful words. Thanks Ste, I really liked the concept of getting them away from screens and outdoors, and it’s a great time to do it. March is the month of winds for us, too. Great descriptors!!!! A beautiful post Andrea, which as always, inspires me. Hello Andrea. I was out in it. The wind blew the rain horizontally across the fields to lash my face. As refreshing and invigorating as it was, I’m glad to see the back of it. It’s nice to have a little calm now after all the winds, take care Mick. To drag youngsters away from their screens and go out to look for and (even better) listen to birds is a great achievement. I hope your winds have’t hindered our migrant birds from arriving or others from leaving for their breeding grounds. Birthday greetings as well! Thanks Richard, that’s one of the things I really liked about the book, to get children observing. Wind is a language I’m always happy to listen to…I love this meditation on the breath of the earth and wish you a wonderful birthday month and spring! Wind is indeed so mysterious. A presence in a perpetual state of wandering. Mmm, I love that description…. Brilliant descriptions of the power and strength of the wind, Andrea. Just as you say, it is not an easy element to describe, or hold; but somehow you were able to bring it sharply to us in so many different forms. I loved every one of your words here, but here’s my favorite: “Red-leaved shrubs move like a whip of flame.” Thank you for this inspiration. Thanks for your lovely comment as always Jet. It must be the most mysterious of nature’s elements. The wind was fierce here for a couple days last week. Luckily, only one tree fell, and it was already dead. Paula Dee mentioned that poem too, which I hadn’t come across before. I’m glad your wild winds didn’t cause too much damage. Your writings are so poetic, and at the same time so precise. Reading your blog is always a pleasure. Thanks Inese, I hope your granddaughter enjoys it! Wonderful post, Andrea. I grew up in fierce dry winds (called Santa Ana winds) in Southern California, and they are still my worst weather days. I love the wind as a symbol, though, and I am interested in the different kinds of winds. Because of Acts 2:2, I see the Spirit as a wind. Love your descriptions. Thanks Carla, I’ve heard of the Santa Ana. I read a book ‘Where the Wild Winds Are’ about the named winds of Europe and it’s interesting the different characters they have and the effect they have on the population. Thanks for sharing that title, Andrea. I have a few books about wind, though not that one. I will look for it. I like what you have said here, Andrea, about the wind having no substance yet being able to cause such devastation. I have not thought of it like that before. I just adore the wind, unlike Mister, who grumbles and grumbles about it, as if it’s only purpose is to annoy him! He classes the slightest breeze as a “howling mighty gale” D: Well, whatever he says, I’ll continue to find my walks in the wind exhilarating, and I agree with you about the wind in the trees. I also love it in the summer when it blows across long grass or corn fields and you can see the shadow of the clouds moving with it. All quite magical. Re the bird book, I think it’s so important to teach children all about the birds. I remember my grandson’s excitement and joy the first time he entered a bird hide and picked up a pair of binoculars! It’s a bit like that in our house Sarah – my partner hates the wind and finds it unsettling, worrying about the damage it might do, while I love the sound of it howling! Denzil’s is a great book to introduce children to birds, it is a joy to find out about the world around you. Andrea, I felt you were talking about me when you expressed how you felt about the wind (your descriptions are always on point). My grand daughter and I were discussing the existence of forces not seen but only felt or made present by their effects. It was enlightening to hear how a nine year old perceives it. And then you revealed you were a child of March, the windy month in your locale. I too am a child of the Ides of March but our windy month is September. I will check out your book recommendation. Happy Belated March birthday Robyn, it must have been interesting to talk about those things with your grand-daughter. Oooh, I love this meditation on wind with wonderful descriptions. My husband and I were sitting out on our deck earlier drinking tea and staring up at the tall pines being twirled around by the gentlest of winds. A reminder of what the more powerful gales can do to trees. Happy Belated Birthday, Andrea! Thanks Cheryl, yes, it’s a powerful force! “I am a child of the March winds”. Wow. When is your bday, Andrea? Sounds as you are implying its in March?” If so, what date? Even though I am a child of March, not so fund of any winds, must I add. Beautiful pictures, too. It’s the 5th Luda, just as the winds are beginning! And a Happy Belated Birthday to you, when was yours Luda? March 23rd :))) thank you !